You should hire me because, I am friendly, efficient, organised and I have been in the Administration and Customer Service industries, since 1998!! I have managed a Call Handling company, as well as a team of Call Handlers, plus I also have experience in training Call Handlers. I know A LOT about what makes great Customer Service. My passion is looking after my client’s customers, so they can get on with running their small business. My knowledge of the many software packages used in the Administration and Customer Service industries is vast! What’s the difference between a Virtual Assistant and a Customer Service Virtual Assistant? Not too much, to be honest, both are very highly skilled individuals. A Virtual Assistant tends to offer general administration services, whereas a Customer Service Virtual Assistant, like me, has chosen to specialises in customer service. This can range from answering your calls, making calls on your behalf, monitoring your emails, assisting with your order management and dealing with the needs of your customers, on your behalf. I work Monday to Friday from 9 am to 5 pm. I don’t work on weekends or bank holidays. How do I sign up to one of your packages? To sign up to one of my packages, you need to complete the sign-up form. A link to this can be found at the bottom of each service page. Once I have received the sign-up form, I will email you to confirm I have received this and arrange for a suitable date and time for us to have a quick chat, if needed for your package. Then the service or services will be set up and away we go! What happens once I have signed up to one of your packages? Once you have completed and submitted the sign-up form, I will have you set up within 24 hours, usually within a few hours, but no more than 24 hours, if the sign-up form is received during my business hours. If it is received at the weekend or on a Bank Holiday, I will aim to have you set up by the end of the next working day. Can I switch to a different package? Yes, of course, you can change your package at any time, once you have taken one out with me. All I require is an email notifying me of this and which package you wish to change to giving me 7 days notice of this change. Are there any services which you don’t offer? I don’t offer any Accountancy/Bookkeeping services as I am not MLR registered. I also don’t make sales calls/cold calls on your behalf. Can I use your services on an ad-hoc basis? Yes, of course, you can, I am here as and when you and your small business require my services. Yes, I have Professional Indemnity Insurance as well as Cyber Liability Insurance. I am registered with ICO as a Data Controller and my Data Protection Registration Reference Number (Data Protection Registration Number) is Z3265525. 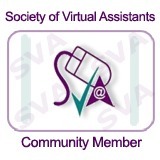 I am also a Community Member of the Society of Virtual Assistants. I accept payment via BACS, Direct Debit (via Gocardless) and PayPal. I do hope that you won’t want to cancel a service you have taken out with me, but you can terminate your Agreement by giving 30 days notice via email. If you fail to give the 30 days notice you will incur a surcharge of £25.00. You can call me on 01822 678499, email me at hello@virtualdelegation.co.uk, or you can also book a FREE Consultation Call with me here. If you are diverting your calls from a mobile number, you can divert these by going into the settings on your mobile, clicking on the phone/call settings. From here you need to insert the divert number (which I will give you), into the call forwarding section and voila, the calls will come through to me. If you are diverting your current calls from a landline number to me, then you will need to speak with your provider about this. There might be a charge for the calls being diverted to me, again you will need to give them the divert number I have provided you with. Do my calls have to be diverted to you at all times? No, of course not, it is totally up to you. You can choose to divert the calls to me when you are busy, unavailable or all the time, the power is in your hands! Can you transfer calls to me? Yes, of course, no problem at all, I can transfer calls to a mobile or landline number of your choice according to the instructions you have given for this on the sign-up form. What happens once you have taken a call on my behalf? Once I have taken a call on your behalf, I then log this detailed message on my system and the message is emailed to you. You can also have the message sent as an SMS message if you required. How long do you keep the messages from the calls you have handled on my behalf? All messages are kept for 3 months before they are deleted from my system and never to be seen again! No, there isn’t a setup fee for any of the Call Handling packages. What is the difference between the calls types? Well the Basic calls (charged at £1.25 per call), are for when I just take a detailed message and email and/or send you an SMS message with this information and the Complex calls (charged at £1.75 per call), are for when I might book an appointment for the caller or use your software to complete the call. Again you are still emailed and/or sent an SMS message about these calls. What happens if you are answering a call on my behalf and another call comes in? In this instance, the second call would be handled by the UK Call Handling company that I work very closely with, so no calls are ever missed. Why don’t you offer a free trial for your call handling service? I am confident that you will be happy with the service that I provide you with as this is my field of expertise, and I pride myself on providing a great service that you will be happy with. What happens to my calls when you go on holiday? Or have a day off? Again, in this instance, the calls would be handled by the UK Call Handling company that I work with. You are advised in plenty of time of any days off I am having (very rare), or if I am going on holiday, (usually just the 1 week in August). You can, of course, choose to answer the calls yourself during this time and you won’t be charged for the service if you choose to do this. How do I know what you sound like when answering my calls? Why not call me on 01822 678499, to see how I answer my own business calls! Unfortunately, yes, there is a setup fee if you require a divert number starting 0207 or 0208. These numbers have an additional one-off set up fee of £50.00 – £150.00. I have no control over this and this is purely a fee that my provider has for these numbers. How do I give you access to my emails? All I need from you is the email address, the password, the incoming server information, the outgoing server information as well as the port numbers for the incoming and outgoing servers and away I go! How often do you check my emails? I check your emails frequently throughout the day. At least once an hour but usually every 30 – 45 minutes, throughout my working day. Emails aren’t checked on a weekend or a Bank Holiday. How do you alert me to important emails? Whilst I am checking your emails, if I see an email which needs bringing to your attention or is urgent, I will either flag it up so you can see this or I will send you an SMS message regarding this. How do I give you access to my Live Chat feature? For this you will need to set me up as an Operator/User, I can then log in to your software and manage this for you. It is always handy for you to provide me with a list of useful FAQ’s regarding your business and or/products. How can you help me manage my E-Commerce platform? Once given access I can log in and keep an eye on incoming orders, I can action these and send them to your supplier if required and I can also add them to your courier systems if needs be. I can assist with the printing/creation (handwritten with real ink) of any gift labels for the recipient as well as update the customer when their order has been despatched and delivered. How do you manage my social media messages? Depending on which social media channel you wish for me to monitor, you will either have to set me up as an Administrator or let me have access to your business account. Once I have been given the access, I can monitor, action and reply to these messages on your behalf.